PrinterTechs is proud to introduce our Long Life P4015 series fusers. We have tested our Long Life fusers to over 500,000 pages, try doing that with a competitors' fuser! That's double the life expectancy of a new Genuine HP fuser. We have two types of fusers: the Long Life remanufactured fusers and the Standard Life new fusers. (Standard life fusers are rated at 225,000 pages.) Our Long Life remanufactured fusers are remanufactured by us, right here in Middleton, WI --- not Mexico or China, like many of our competitors' fusers. We control the quality by using our own experienced technicians and our own long life parts. The maintenance kit includes a fuser, transfer roller, 6 cassette feed/separation rollers, and 3 cassette pickup rollers. For use in the HP LaserJet P4014, P4015, P4515 series printers. Save money by purchasing the fuser on exchange; see exchange terms in the details below. 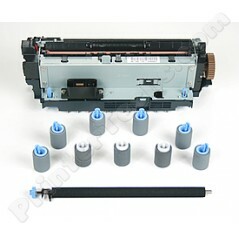 HP LaserJet P4014 P4015 P4515 instructions for replacing the fuser and maintenance kit. Also, installation instructions are shown at the end of the video below.